Providing you the best range of blister packaging with effective & timely delivery. 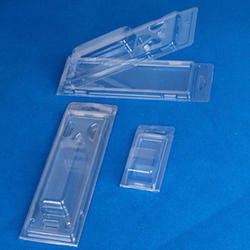 We are recognized as one of the best Blister Packaging manufacturer and supplier of Mumbai. Blister Packaging is a type of flange folded blisters which are very common overseas. The blister packaging is designed by using innovative technology that the customer can easily detach the card see and after using the product again can place the product inside the blister slide the card and the pack is closed. Mainly it is designed for cutlery, consumer goods, cosmetics, surgicals or pharmaceutical products, and machine parts. No machines required to seal packages.